Leanne and I have explored Paris on the #69 bus that goes to the Pere Lachaise cemetery and Florence, where the #7 bus goes up the hills for a view of the city. We visited Berlin when we were young, before the Wall went up, and when we were old after it came down. We got to know London and Melbourne well, came to love Venice. But in 40 years of living in Southern California, we’ve never spent a week in L.A.
Leanne and our Hollywood cottage retreat. 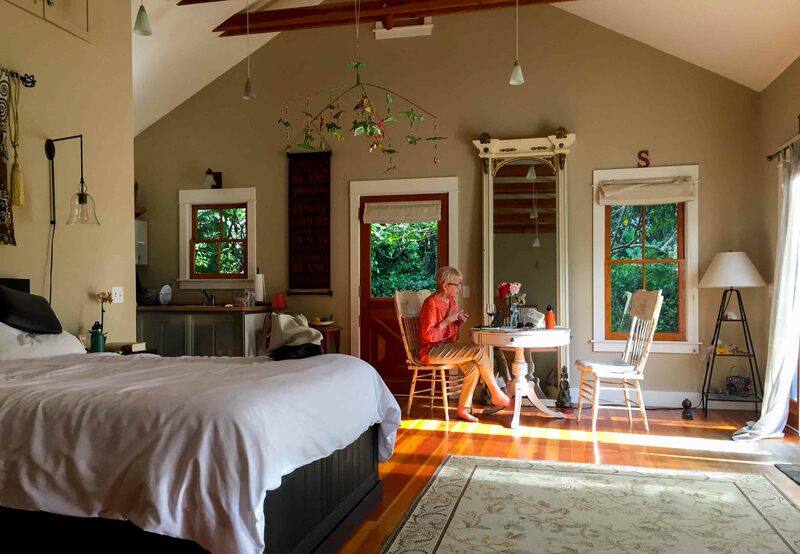 We corrected that oversight, spending a delightful week in a cottage, formerly a stables behind a 1906 house in Hollywood. Los Angeles has the reputation for being a hard city to visit, with its sprawl and vast distances. Around the intersection of Hollywood Blvd. and Highland Ave., a tourist magnet draws the curious to the sidewalk embedded stars, a couple historic theaters, and frequent media events. But, hiding in plain site are streets where people live and where interacting with them brings the same spontaneous delights as talking to an old schoolteacher in Italy or a Black Cab driver in London. Our Airbnb, was billed as Idyllic Hollywood Cottage Oasis, and it was as good as its ad. 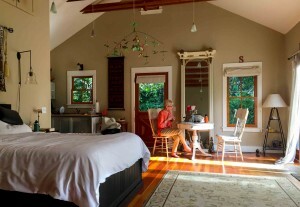 We settled into the cottage, which architect and owner Jeff Smalley had redesigned. The old barn door slides to close off the bathroom. That evening, we walked a few blocks to The Pikey on Sunset Blvd., a Brit influenced pub and restaurant with good beer and an interesting menu, including vinegar chicken and a side of thrice cooked fries. A bit like landlubber’s fish and chips. This isn’t going so well. I am having news withdrawal symptoms. I look at some of the Twitter feed and the email subscriptions I get every day and think them boring. But my fingers want to be on a keyboard, and there are ideas out there that need exploring. I’ve been fascinated by the Boyle Heights gentrification protests, particularly the specter of people in masks, more fashionista than Zapatista I think, protesting a coffee bar where one of the owners is white. L.A. Times columnist Steve Lopez visited as the employees were sweeping up broken glass from vandalism. Silly, he said. The owners report that the protests are attracting business. Boyle Heights, a neighborhood just east of downtown Los Angeles, has always been a neighborhood in transition. It was the site of one of the first Jewish settlements in Los Angeles, and the Breed Street Shul built in 1923 still stands, although the Jewish vanguard decamped to Fairfax Avenue and points west many decades ago. Remnants of a Japanese community are still visible: some very old settlers, a large temple, and a cemetery. These days, diversity largely means mixing waves of Latino immigrants. Press accounts call this “vibrant,” and I suppose it is. Unlike many older suburban areas, there were not many vacant storefronts on Cesar Chavaz (formerly Brooklyn Avenue) even when I worked in Boyle Heights 15 years ago. There were people on the streets, and walking from the Breed Street School down to 3rd Street took you past front yards where chickens were pecking at the earth oblivious of their in-the-pot fate. But there was also a lot of violence. After an evening meeting, it was possible to hear the pop-pop-pop of gunfire as one walked to the car. A reforming gang member was killed in a revenge shooting at the Smart & Final across from the school, one of the scores of Father Boyle’s Homeboys he has buried. TV journalist John Merrow came to town to do a story on what he termed a gang-prevention program called the Society of Students. (SOS was really much more a build resilience program, and I’m sorry that it hasn’t spread.) Merrow remarked that the neighborhood looked kinda nice, not like the slums in older eastern cities, and he wondered what the big deal was about violence. I told him to ask the kids to demonstrate the pancake drill. Elementary students at Breed were taught, “when you hear gunfire, make yourself a pancake on the ground.” The students demonstrated. Merrow was amazed. The point of this is: let’s not romanticize Boyle Heights or other places that are in the process of gentrification. It’s not like anyone with a half a foresight couldn’t see it coming. Stand on a patch of land with a clear view to the west, and rapidly revitalizing downtown is clearly visible. You could work there and walk home. There had been a housing boomlet before the crash of ’08. Now it’s back, with the help of the new light rail Gold Line that connects Boyle Heights and the rest of East L.A. to the city center. Boyle Heights is simply too close to downtown to remain a real estate backwater much longer. The question is: Can a rising neighborhood lift the people who are already there, and if so how does it do that? People looked at us in disbelief. “Wouldn’t happen,” they said. “No one wants to go to school with poor kids.” But that’s exactly the problem will face Los Angeles schools. If young middle class families move back into the city, where will they school their children? If LAUSD builds itself around only being the educator of last resort for poor kids—the “chooser” kids having left for the charters—then it creates class segregation for itself and its students. 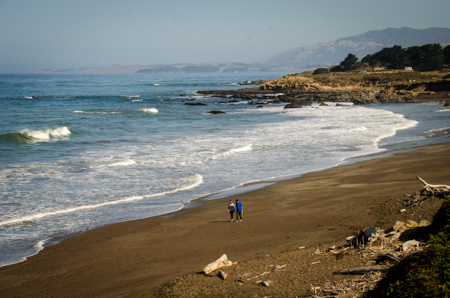 Moonstone Beach, Cambria, extends for a mile. Most of it is rimmed by a boardwalk. On the first week of retirement my true love gave to me…. A list of all the things I hadn’t done around the house while using writing the EdWeek column as an excuse. Since I’ve been a workaholic for a long time, the list is long. Neighbor Arthur’s elm was brushing against the tile roof and needed trimming before the next storm. The patio needed power washing, something that was forbidden during the drought. And one thing led to another. After the patio was washed down, the deck looked a little grubby, then the house, then the flat roof. Why not spray down the car? Good job, Chuck, she says while reminding me that I’ve only put a dent in the list. My end of the week reward was a drive up the coast to Cambria, and a glorious two days of walking on the beach and driving up California 1. The highway is closed in two different places. A collapsed bridge stops southbound traffic. And a massive landslide about 18 miles north of Cambria halts northbound traffic. Hearst Castle is still open. Leanne and I had a delightful drive to the end of the road. Since the road doesn’t go through, there was virtually no traffic. No 50-foot RVs driven by flatlanders meeting you around the hairpin turns that are posted at 10 MPH. Plenty of spaces at the turnouts for long looks at a cobalt blue ocean. Even the Elephant Seals seemed to be a good mood. The big males were play fighting in the surf. The females and the young had abandoned them for their long journey in deep water, so the guys were just hanging at the beach waiting for their fur to molt before heading to Alaska. Theirs is the ultimate male spa. Soon, maybe already, ‘On California’ will no longer be listed among the active blogs at EdWeek.org. It should be available in the archive at the bottom of their blog listing. I will be jotting things here at mindworkers.com and probably, because I can’t help myself, at other locations. Last week I put ‘On California,’ my column at EdWeek.org on hiatus, maybe permanently. Retirement has always been a funny concept to me. I’ve failed at earlier attempts, but it’s time for an earnest try. I was 16 when I walked into the Barrington (Illinois) Courier-Review with the object of being its sports photographer and walked out a salaried sports reporter and editor. Salaried at $10/week, a credit card at the Standard Oil station down the street, and reimbursement for photo supplies. I learned basic Associated Press style, who-what-when-where-why-how-leads, and the capacity to write on deadline. Shortly, I was contributing 40 column-inches and a couple pictures to each week’s paper. It was about as much fun as a teenager could have, and it turned my head toward journalism as a career. At the University of Illinois I majored in Daily Illini, missing so many classes that I had a reoccurring dream that I was in a final exam for a course that I had never attended. This common dream was so plausible in my case that I kept a copy of my class schedule thumb tacked to the bookcase next to my bed so that when I woke in a sweat I could verify my registration. My grades were mediocre enough in the classes I did attend. For more on the Daily Illini, see Roger Ebert and Me. I found love at Illinois, too, and shortly after graduation married Leanne Bauman, who remains my partner in everything. We stayed on for a masters. I graduated with the first class of MBA students that the university produced, and I believe that I hold the distinction of being one of the lowest paid MBA graduates in the country. This maybe excludes nuns and inmates. Academic life, almost all of it at Claremont Graduate University, served me well, and I think that I reciprocated with good work. They gave me some momentos after I had been on the faculty for 35 years, and I concluded that three and a half decades of teaching was both wonderful and sufficient. The prospect of bookending my career with journalism seemed appealing, and I thought that I might write a dozen or so commentary pieces over a year. Since starting ‘On California’ in 2014, the column has posted 281 pieces, most written by me and edited by Leanne. Both author and editor need a rest and a taste of retirement*, so we’ll put ‘On California’ on hiatus. Thanks to you all. In my Christmas letter, volume 54 of the Kerchner Chronicle, I promised readers an extension of the narrative here on the Mindworkers blog. That was probably a mistake. Christmas letters are a difficult genre. They veer from cute to seriously boring, and it’s hard to say anything substantive about family issues—no, no, too much information—religion, politics, economics, anxiety, sickness, or death. Which is why there are lots of vacation pictures. There are a few memorable variations. A friend of my parents used to draw clever cartoons and produce them on blueprint paper. One particularly foolhardy relative devotes most of his letter saying snarky things about his wife, which he doesn’t believe, or says he doesn’t. But for the most part there are straightforward narratives about the past year, and particularly about family gatherings and travels. So, like other folks, I’m back to exploring the year; reliving some of the best parts of it and sharing some pictures with you. For a little fun, read the Red Sock Caper below. Just when your eyes were beginning to cross reading ed policy verbiage, I offer the mystery of the Red Sock. The red sock disappeared. Leanne had given me a very comfy pair of bright red socks that I wore when I was feeling reckless, wanting to make a fashion statement, or to put out flares that I wasn’t to be messed with. Thus, the socks were worn with some frequency, and they looked great with jeans and loafers. But socks get dirty, and these were wool, so were dried outside. When last seen they were draped over a chair in the back yard. When Leanne went to collect the dry socks, she only found one. The wind must have moved it, we thought, but inspection of the patio, the flowerbeds, the fishpond proved futile. Something took the sock, and we speculated whether it was an old crow, a young possum, or maybe Mischief the across-the-street cat. The caper of the disappearing sock, we thought. 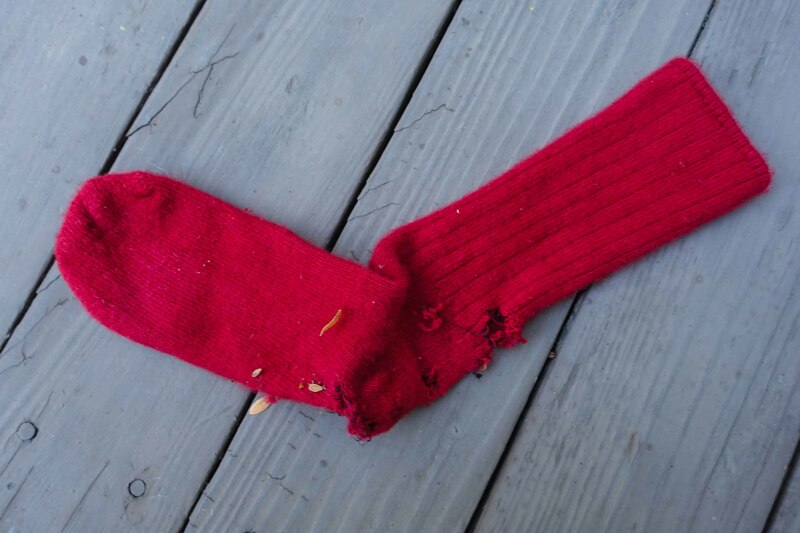 But Saturday morning the sock reappeared, artfully draped over the back steps, gnawed and mangled, but returned, leading to the greater mystery: the caper of the reappearing sock. What kind of animal returns a sock? Speculation is running toward a socialist possum, which took what he needed and returned the rest, or maybe a playful raccoon, which tired of soccer (socker?) and discarded the toy where it was found. The postal service lost the letter. Again! I even delayed my vacation to be waiting by the mailbox for the trusted Michael the mailman to deliver the good news that I had been selected for a MacArthur “genius” fellowship. But nothing. Fellows will each receive a no-strings-attached stipend of $625,000, paid out over five years. The Fellowship comes with no stipulations or reporting requirements, and allows recipients maximum freedom to follow their own creative visions. But in truth, these sound like some folks that I’d like to have lunch with. Genius travels. Talented people congregate because being in the company of other energetic and driven people multiplies their own disciplined gifts. And when they travel, they come to California. Then, as a sobering aside to the self-limiting costs of aggregation, it notes that adjusted for size the states with the most resident MacArthur fellows are New Mexico, Alaska, and Vermont. I’m sorry. I’ve been away for a while and didn’t tell you. Writing the ‘On California’ blog at EdWeek.org has become such a full time job—my wife Leanne thinks it is an obsession—that I’ve had little leftover time for Mindworkers. Also, given that I have another outlet for educational policy writing, I need to rethink what to do with this space, and that’s a work in process. Just to reflect, in many ways ‘On California’ is the project I was built to undertake. It’s the newspaper column I never had. It’s a way to combine my early training and instincts for writing with four decades of social science. In another way, though, it is tough work for an old guy, and there are days that I think that something more contemplative would be better for my soul. I promise I will come back soon. As soon as I figure out what to say.